With the signing of Chone Figgins by the Mariners, it leaves you to wonder if Bill Hall even has a chance of making their team. They have a well stocked outfield and a very capable backup infielder in Jack Hannahan. 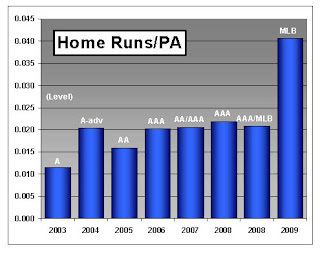 They are only on the hook for about $2 million of his 2010 contract (with the Brewers paying the other $7 mill+). It makes you wonder if the M's will just cut their losses and let him go. 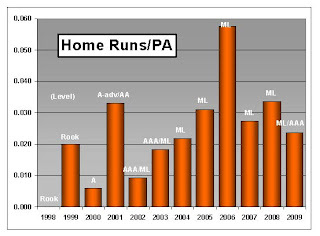 When you look at Hall's career power numbers, it's clear that his 35 home run season in 2006 was an aberration. I'm just saying that we need to be very careful about our future expectations of players when we see things like this.